Hamburgers are a staple at backyard barbecues. Though burgers are a relatively simple food, mastering the technique to grill burgers is no small feat, as there is more to great grilled burgers than simply firing up the grill and dropping down a patty. · Choose fresh ground beef that has a decent percentage of fat. The fat-to-lean meat ratio should be around 20 percent fat to 80 percent meat. Spend a little more to get freshly ground meat that has not been previously frozen. · Don’t overwork the burgers with a lot of handling. This will warm up the fat in the burger, which causes it to emulsify and could make the meat rubbery. · Reconsider adding a lot of herbs, spices or add-ins to the burgers, as such items can detract from the flavor of the meat. Extra herbs and spices also may require extra mixing, which can lead overhandling. · Push a dimple into the top of the burger, which will help prevent the burger from expanding upward and out while cooking and rounding out in the process. The dimple will keep the top of the burger flat, which facilitates easy topping. · Make sure the grill is hot. Burgers do well with high heat and will cook relatively quickly. 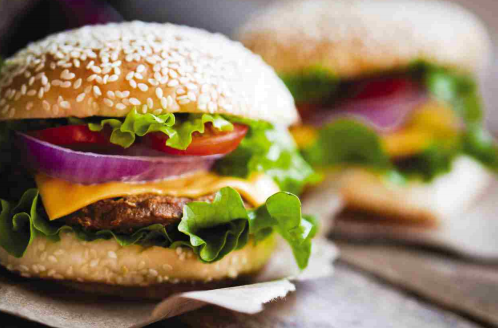 · Resist the urge to push down on the patty with your spatula. This will cause the juices to spill out and may result in a dry, tough burger. · Let burgers rest before serving. This lets the juices redistribute throughout and makes for a moist and tasty first bite.